Alright, track has been re-designed and the initial build will commence after August Long Weekend. Kevin Pelletier will once again work his magic to shape the new track and then I am hoping to get some top notch volunteers (like last year!) to help with miscellaneous work on August 9th. We have the tree section to extend, relocate/build new matrix, relocating the fire wood pit, creating a new X-factor log section, placing/fastening additional logs, creating a joker lane, etc. 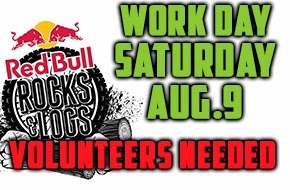 Red Bull will be supplying lunch and drinks (Red Bull of course to keep your energy up) and plan to start at 10AM. - Anyone with minimum 3/8” rebar or sucker rod (at least 3’ lengths) for donation or sale, please anti up. - Even another skid steer to move stuff around and misc. work. PS – Event Date is Sept. 20/21 and should be going live for registration very soon!